difficulty healing wounds (including trophic ulcers and bed sores). For the treatment of trophic lesions of various origins tissues Solkoseril is applied only after the removal of necrotic tissue from the wound. Solkoseril gel is applied in the initial stages of treatment and applied on fresh wounds, wounds with a wet discharge or ulcers with symptoms of soak. 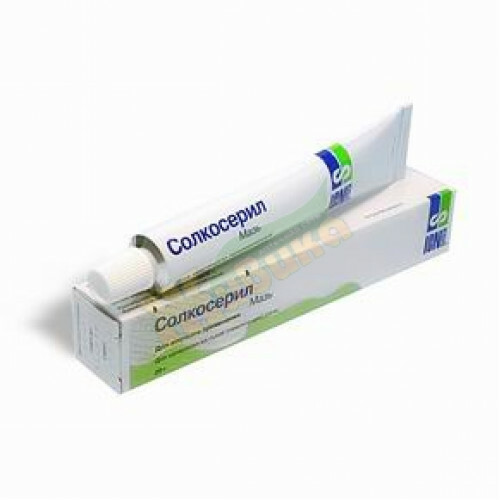 Solkoseril ointment is used primarily for the treatment of dry (not weeping) wounds. Contraindications: Hypersensitivity to one of the components of the preparation. Caution should be used when a predisposition to allergic reactions.